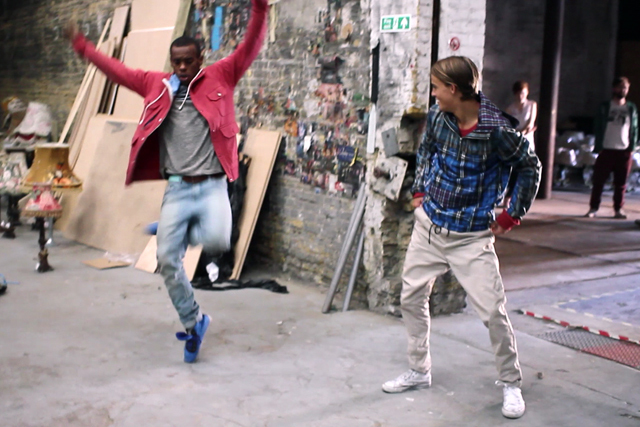 Jaw-dropping dance moves and cutting-edge technology come together in an Asos campaign. In July, we were appointed by Asos to create a campaign promoting its autumn/winter 2011 menswear collection. Surprisingly, research showed that young men believed Asos was a women's brand. Our job was, therefore, to get them to notice Asos and get them thinking about the brand differently. We also discovered these guys get their fashion cues not from the catwalk or from fashion magazines, but from people on the street. We thought it would be cool to create an experience that allows these guys to travel around the world to key cities and discover fresh urban culture, all the while being able to browse and purchase the look they saw without leaving this world. But rather than simply documenting this urban culture, we felt we needed to create an experience that commanded attention. The ambition was to devise a film centred around an amazing performance so that it would get shared even without interactivity. We had always been inspired by a lot of dancing we found on the web, and this led us to scour the world for the best urban street dancers. We were incredibly lucky to get the guys we did - they're considered to be among the top ten street dancers globally. When we started filming, they didn't disappoint. Their moves weren't choreographed. They were all simply told: "When the camera is on you, perform." Despite three long shoot days, these boys were super-professional and willing to push themselves physically in the pursuit of something special. Additionally, I managed to pick up some moves for the next company Christmas party. After the first day of shooting, we spent the night in the edit suite. To allow people to click on any of the dancers at any time and check out the clothes, we had to create a series of break-out moments whereby the action would rewind or forward to a specific performance. We had to lock the edit that evening in order to agree at what exact point in the film we would need to stitch together a scene in which the dancer would stop what they were doing and come to life to show off their clothes. The intro sequence alone starts with a 3D globe transitioning into a sequence of Nasa images, to a helicopter shot over London. We then switched to a large crane, which brought us down to a handheld cameraman moving into the Shoreditch warehouse where the film was shot. This all had to be painstakingly stitched together to give the appearance of one take. Everything about the job was ambitious - from the timelines for the shoot and the interactive build to the feature list. In just seven weeks, we did everything from start to finish. The Flash video allows user interaction to freeze time for all but the main character by manipulating the timeline of the enormous (up to 200MB in total) video assets; cleverly loading the assets as required to allow users to get into the experience as quickly and seamlessly as possible. A full-featured CMS and integration with the prelaunch Asos API allowed full product management and integrated e-commerce functionality from directly within the experience, including stock availability and pre-buy configuration. The scale of this and the amount of things involved is crazy. The frozen-moment effect has been used before (by us in "carousel" for Philips, for instance), but not by making the main character step out of the freeze and into a little performance, and not with lots of separate frozen moments spread over two minutes of a four-minute film - and certainly not with handheld footage. In the end, it was a labour of love that nearly killed everyone involved. The site was a beast to produce, but something we are very proud of. If I had to choose a favourite bit, it would be where the dancer Marcio is spinning on his hands. When you click on his tag, he freezes except for his head, which turns and smiles in a way that still freaks me out. After only a few weeks of the site being live, it has had more than 3.2 million views. It's enormously satisfying to hear that people love the performances, the experience and the clothes. And men now realise that Asos is not just for girls.